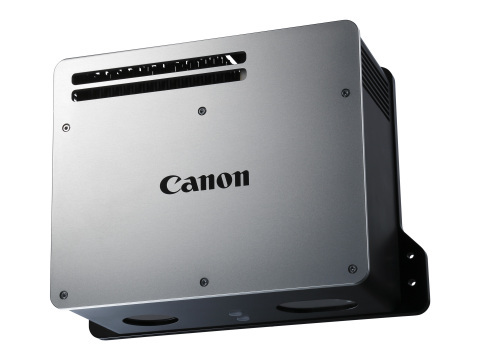 MELVILLE, N.Y. — (BUSINESS WIRE) — July 16, 2015 — Canon U.S.A., Inc., a leader in digital imaging solutions, today announced the entry into the growing machine vision market in the U.S., with the launch of 3-D Machine Vision Systems, models RV300, RV500 and RV1100. Designed for use with industrial robots, these systems are capable of high-speed, high-accuracy three-dimensional recognition of objects. The systems in combination with a robotic arm can help increase production efficiencies in factories by facilitating the automatic high-speed supply of parts to production lines. Enabling a robotic arm to accurately and successively recognize and pickup individual items from a randomly assembled pile of parts requires a system capable of the three-dimensional recognition of the shapes of the parts. All three models of Canon’s Machine Vision system feature a 3-D machine vision head, which encompasses the system sensor and 3-D machine vision recognition software for recognition processing. The highest level of performance in speed and accuracy for three-dimensional object recognition capabilities of the Canon’s Machine Vision system were made possible by applying innovative image-recognition and information-processing technologies cultivated through Canon’s research and development of cameras and business machines. Canon’s 3-D Machine Vision systems can accurately recognize a diverse range of objects, including parts with curved features, parts with few distinguishing characteristics and intricately structured parts. The RV300, RV500, RV1100 enable the 3-D recognition of randomly piled parts as small as approximately 10 mm2, 20 mm2, and 45 mm2, respectivelyi. Contributing to improved production-line efficiency, all three models deliver high-speed performance, taking only approximately 1.8 seconds to recognize randomly arranged small-scale parts in 3-D. This data is then sent to a robotic controller unit attached to the robotic arm. The new systems feature high-performance 3-D recognition with a high level of accuracy; the RV300, RV500, and RV1100 achieve exceedingly small error tolerances of less than 0.1 mm2, 0.15 mm2, 0.5mm2, respectively. Users can easily register data for parts to be picked up by inputting CAD data and by capturing images of the parts randomly assembled in a pile. The 3-D machine vision systems can use computer-generated images to automatically learn how to visually identify the parts. Since no complicated programming is necessary, users can easily re-register parts in accordance with changes in type and shape of parts to be supplied in production. The Canon 3-D Machine Vision System is capable of instantaneously measuring the location and orientation of designated parts in three dimensions and helps eliminate the need for separate 2-D vision sensors to determine the positioning of parts or a table on which to temporarily place parts during the parts-supply process. Accordingly, the system allows the construction of production lines to be simplified for parts provision while achieving higher efficiency in feeding parts to the production line. In 2014, global sales of 2-D and 3-D machine vision systems for use with industrial robots totaled approximately $22 millionii. The market for 3-D machine vision systems is expected to grow significantly in the future, driven by strong demand for the further automation of production lines used by manufacturers in a variety of industries, including automotive and automotive component manufacturers. The Canon 3-D Machine Vision Systems, models RV300, RV500, and RV1100 are expected to be available on Oct 1, 2015. Canon U.S.A., Inc., is a leading provider of consumer, business-to-business, and industrial digital imaging solutions to the United States and to Latin America and the Caribbean (excluding Mexico) markets. With approximately $31 billion in global revenue, its parent company, Canon Inc. (NYSE: CAJ), ranked third overall in U.S. patents granted in 2014�nbsp; and is one of Fortune Magazine's World’s Most Admired Companies in 2015. In 2014, Canon U.S.A. received the PCMag.com Readers’ Choice Award for Service and Reliability in the digital camera and printer categories for the 11th consecutive year. Canon U.S.A. is committed to the highest level of customer satisfaction and loyalty, providing 100 percent U.S.-based consumer service and support for all of the products it distributes. Canon U.S.A. is dedicated to its Kyosei philosophy of social and environmental responsibility. In 2014, the Canon Americas Headquarters secured LEED® Gold certification, a recognition for the design, construction, operations and maintenance of high-performance green buildings. To keep apprised of the latest news from Canon U.S.A., sign up for the Company's RSS news feed by visiting www.usa.canon.com/rss and follow us on Twitter @CanonUSA and @CanonUSAimaging. ii Market data based on Canon’s own research.